When Little M was tiny, I was often desperate to get out for a walk, but found it really dull walking around the same old streets of our neighbourhood all the time. However, many of the places that hubby had gone for walks pre-parenthood, just weren’t suitable for walking with a pram. With that in mind, I’ve put together a list of my favourite five pram-friendly walks, all within a five-mile radius of Norwich city centre. There’s a map at the end to help you find them. I love Eaton Park. It only takes around 10-15 minutes to do a lap so ideal if you don’t want to be out too long (perfect for those post-c-section shuffles). 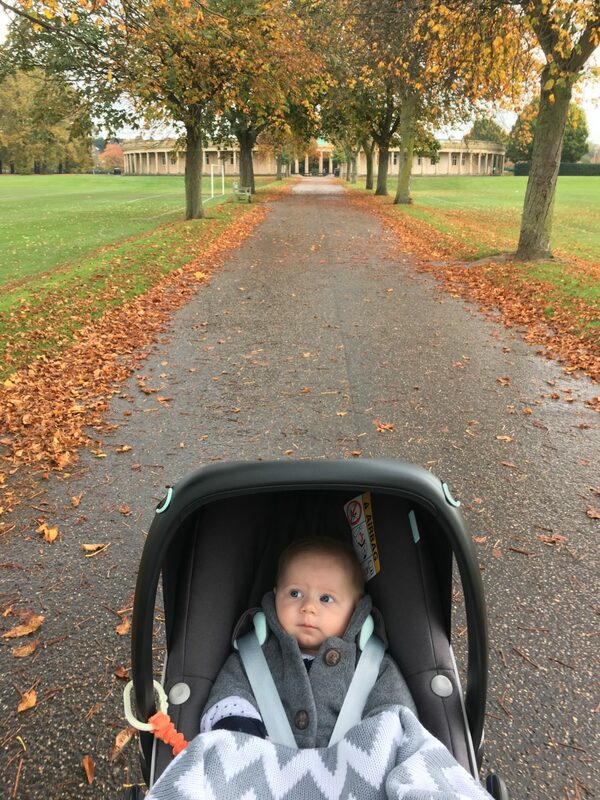 There are plenty of paths which make it a breeze with a pram, pushchair or stroller, and means that the terrain is easy, regardless of the time of year. There’s free parking, too. The park has a good play park for older children and a boating lake which often has model boats whizzing around. There’s even a ride-on train which operates at specific times, a pitch and putt course and even a skate park if you’re that way inclined. My favourite thing about Eaton Park is the café in the pavilion that does fab gluten free brunches (and regular ones, if you don’t have any pesky dietary requirements). Whitlingham is slightly less easy on the wheels than Eaton Park. Some parts of the path around the broad are gravel so it can be a slightly harder push in places, but is still accessible. There’s a chargeable car park but it is possible to park on the road nearby if you don’t mind a little walk, before you start your walk! I find Whitlingham Broad very peaceful to walk around. There are water-sport activities if that’s what floats your boat (pun totally intended; sorry, not sorry) but I just like to watch as I walk. An array of ducks and swans are always waiting on a little shingle ‘beach’ for any tidbits the visitors to the broad might bring from them, so it’s a nice place for a bit of toddler-wildlife interaction. There’s also a visitors’ centre with a café that sells decent hot chocolate and a reasonable gluten free chocolate brownie. My husband recently discovered this little route while out exploring on his bike so we took a walk around it the other weekend. It’s a loop, which took us around an hour, chatting with friends and stopping to look at birds and cows as we went. We parked on the road and took a little walk down to the walking trail. No café here, I’m afraid, but it is just down the road from Waitrose, so there is snackage available nearby! The terrain can be a little bumpy in places so you’d be better off with a sturdy pushchair rather than a lightweight stroller. 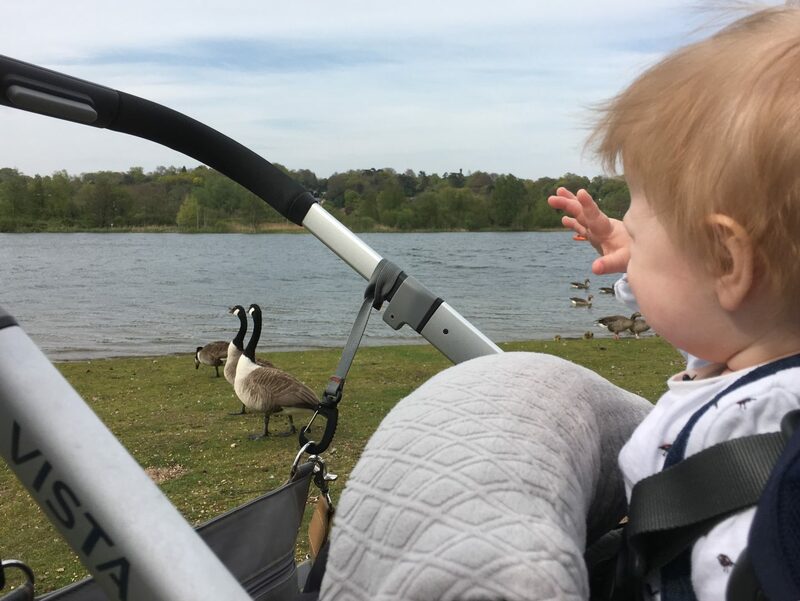 We’ve taken both our Uppababy Vista and Hybrid Stroller round and they both managed it. 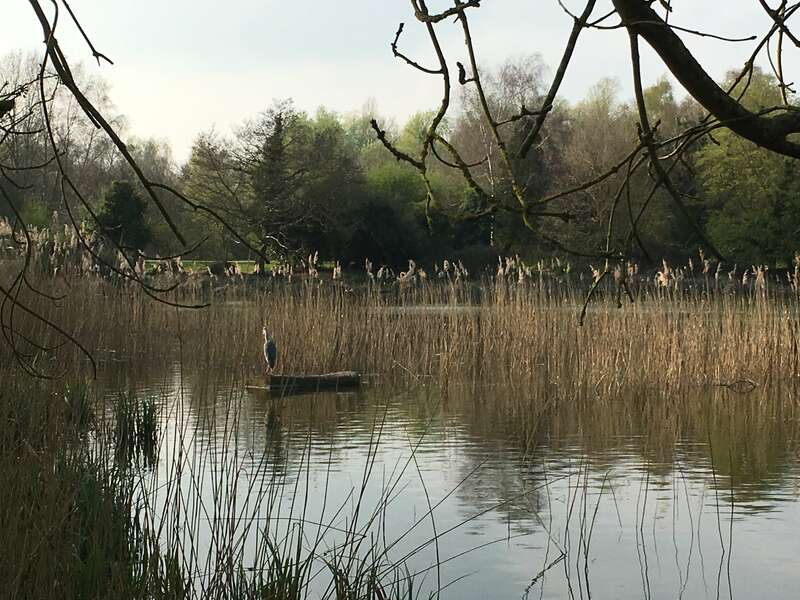 This man-made lake, in view of the UEA ziggurats, has long been a favourite walk of ours. It’s boarded in some places, but definitely isn’t in others, so again you’ll need a fairly sturdy pushchair, but it is accessible at all times of year. 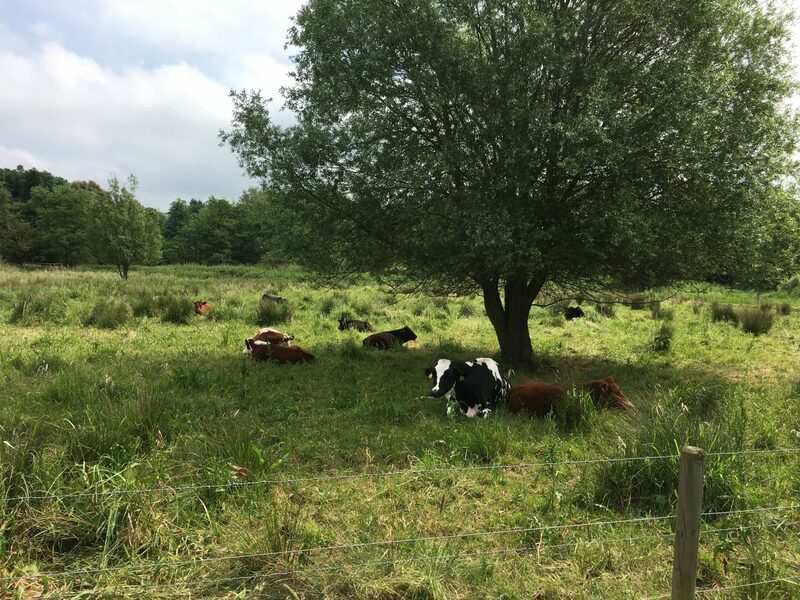 Whilst there’s free parking at the entrance to the woods on Colney Lane, unfortunately from this direction there’s a metal bridge with steps that you’ll need to lift the pram over, so it’s not ideal if you’re recovering from a recent c-section! It is a lovely walk, though, and at just over a mile all the way around, it isn’t too taxing. There’s a cafe in the Sainsbury Centre art gallery next to the lake, but I haven’t been there for years so can’t give any further details on their offering! 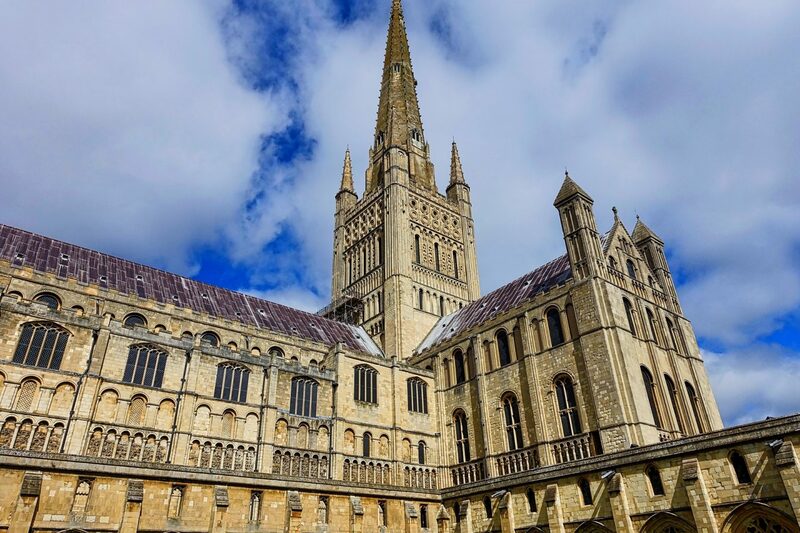 If you’re in Norwich city centre anyway, it’s nice to wander around the cathedral grounds and even have a little walk alongside the river, just up the road from the cathedral. It’s all paved, so an easy push. There’s a pay and display car park near the Adam & Eve pub next to the grounds, if you want to park nearby. There is a café, The Refectory, but I’ve never eaten there myself so can’t comment on the quality! My favourite café for gluten free cake in central Norwich is Biddy’s Tearoom, but it’s about a ten minute walk from Norwich cathedral. Definitely worth a look if you’re exploring the city or doing some shopping and need a little break, though! 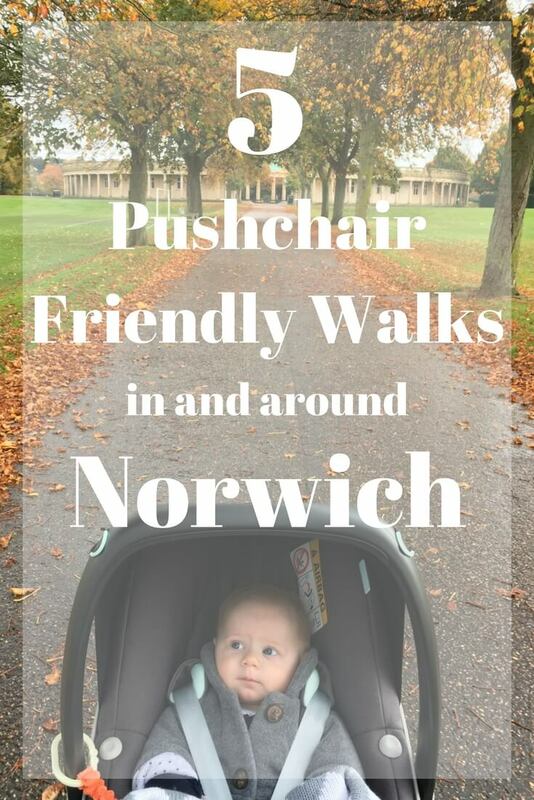 I hope you’ve found this post helpful and will use it to discover some new, pushchair-friendly walks in and around Norwich. Is there anywhere I’ve forgotten? Where’s your favourite place to walk. "Little Tikes Perfect Fit 4-in-1 Trike Review"